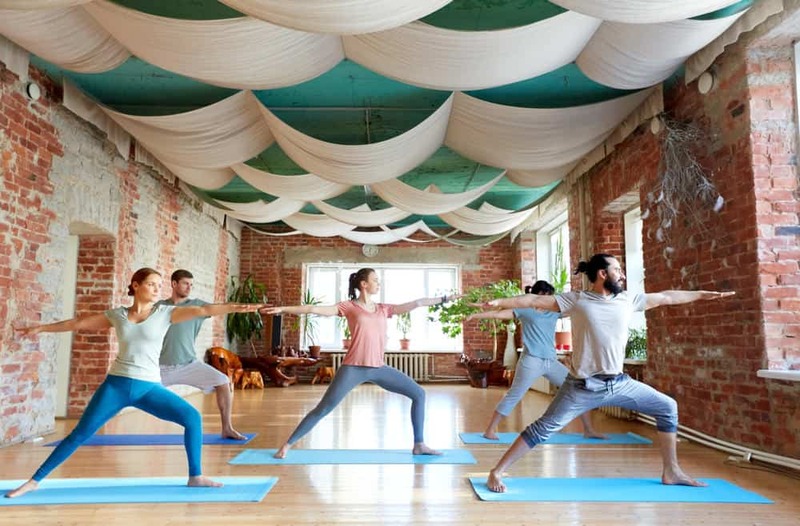 This is the ultimate guide to designing a yoga studio space including the yoga studio, reception area, lighting, flooring, exterior, retail area, bathrooms and so much more. 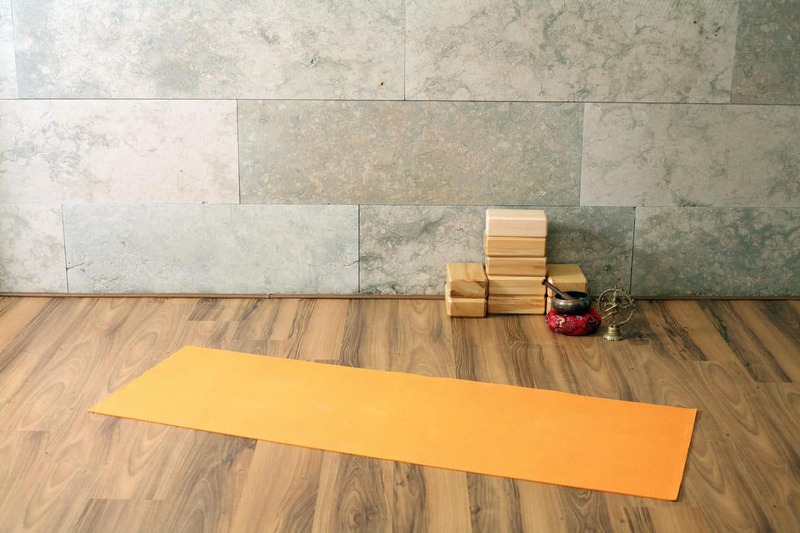 Yoga studio design refers to your color scheme, décor, and furnishings. You can do this yourself or hire an interior designer. I’m not an interior designer, but I’ll make some basic recommendations. The sky is the limit to creating a beautiful and functional yoga space. However, one must is hardwood or laminate (looks-like-wood), bamboo, or cork. Avoid linoleum, vinyl, marble, carpet, and concrete. Wood flooring is warmer. If you want padding for your clients, offer mats (a given), bolsters, blankets, and foam blocks. You have to consider the style of yoga you teach also. If you teach kids, make it kid-friendly. If you teach Iyengar and will us the wall, keep pictures off the walls. Of course there is not a one-style-fits-all yoga studios. In fact, uniqueness and individualism in design is another element that can make your yoga studio stand out. 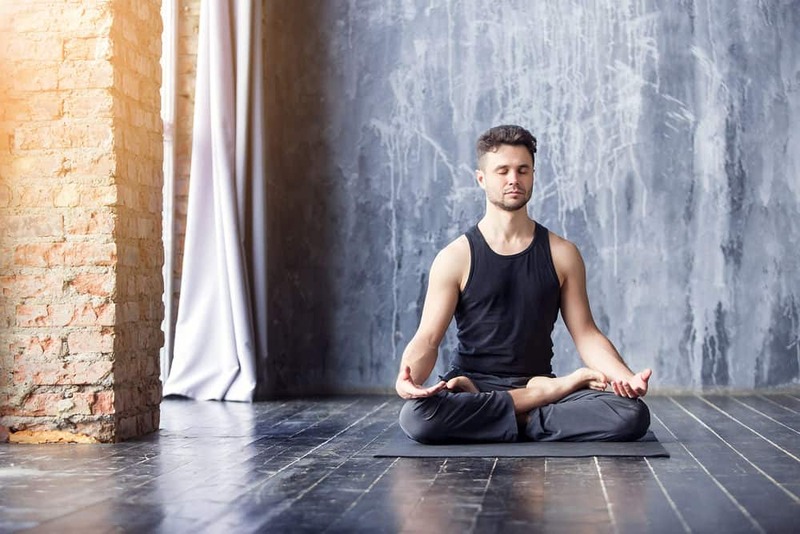 It’s also important to know that you do not need to spend a fortune in order to create an inviting and thematic design appropriate for a yoga studio. Assuming you have the basics (a great floor and a workable layout), it’s amazing what some paint and carefully selected furniture/accessories can do to transform a yoga studio. The following are some guidelines with yoga studio design – inside and out. Please don’t take the following as ironclad rules. They aren’t. Much of it based on my preference … but many of the tips are universally good ideas (such as easy on the incense, don’t use carpet in the studio classrooms and keep your studio clean). I hope you find the following helpful as you start your new studio or improve your existing studio. Most yoga studios have a perspective/focus. It may be a fitness-perspective, spiritual perspective, tranquility perspective – something that is the driving objective for students. I realize many studios offer a variety of classes that meet different objectives, but if you can, determine your studio’s overarching focus. Obviously, there’s overlap among the perspectives. However, if you can identify the overarching perspective, you can start narrowing down the type of overall design theme you’d like to achieve for your studio. The following are some design themes that might inspire you and direct you. The outdoors inside: a nature theme which may include nature sounds, trees/plants, wood, etc. Urban: wood, glass, steel and concrete. Industrial: Exposed ceilings, concrete, steel, brick. Light and airy: pastel colors, expansive spaces, plenty of natural light. Bright and cheerful: bright colors; slightly eclectic. Vintage: You could transport your students to a different era with design. This could be fun. Minimalist: Perhaps you have a conservationist message to pass on as well which you can do with a minimalist theme. Modern European: white, sleek curves, stylish, glass. Cottage Style: light colors, soft, airy, casual. Caribbean/Resort Style: invite students to the tropics with Mediterranean and tropical colors. Whichever style you go with, try to see that your entire studio is decorated in that style. Be consistent throughout so the experience is consistent for students. Moreover, the above is not an exhaustive list of design themes. I just wanted to provide you a list of themes/overarching designs I believe work well with yoga studios. For example, I didn’t list “gothic” style because I don’t think that’s a great design style for a yoga studio. Magazines: Architecture, Home, Travel, Spa and Resort themes magazines are excellent. Visit other studios: See what other studios are doing for ideas. 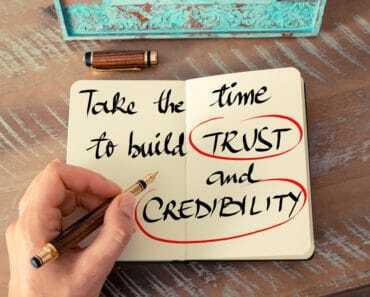 Visit Spas, Resorts and Boutique Hotels: Don’t just read about them in magazines – go and check out what related businesses are doing. Watch HGTV or other design networks: You’d be amazed at some of the tips and ideas you’ll discover watching design TV. Read design-oriented websites: Even if they aren’t specifically yoga studio design oriented you can learn a great deal of design tips and get inspiration. 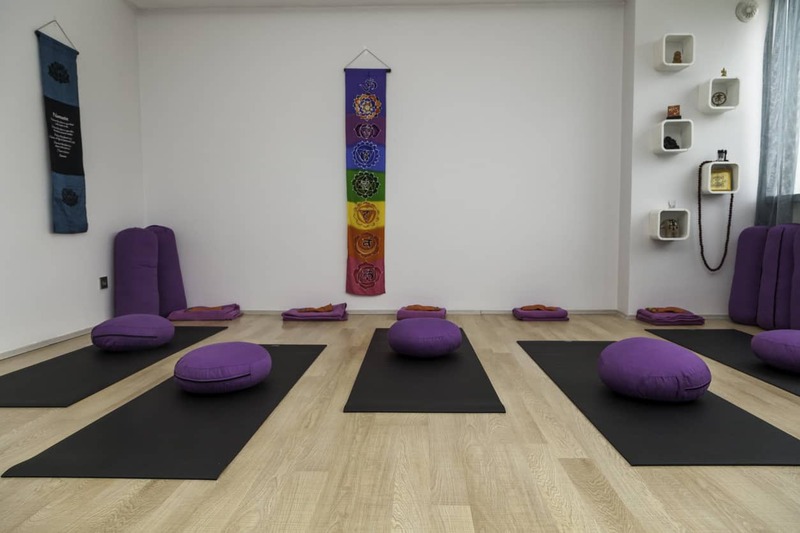 Without a doubt, color can set the tone in your yoga studio. Individual colors and color schemes should be considered carefully. The best site on color and emotion (as well as color theory) that I found and visit quite a bit when needing some color guidance is Color Wheel Pro. You can spend a fortune or give your studio a design overhaul on a shoestring budget. Don’t let limited resources stop you. Paint/color can go a long way to improving your studio design. It’s amazing what the right color scheme can do to improve your space. Inexpensive and/or used furniture can improve your studio space considerably. Personally, I like IKEA furniture – it’s inexpensive and looks great. Yeah, I know its quality is questionable, but on a limited budget you won’t do much better elsewhere unless you find some great used furniture deals. Photographs and fabric wall hangings can improve your non-class space very well. I’d avoid hanging anything on the walls in the actual classroom space because walls are handy for yoga. Use stylish and up-to-date window coverings. Ratty curtains or blinds can detract from your studio. 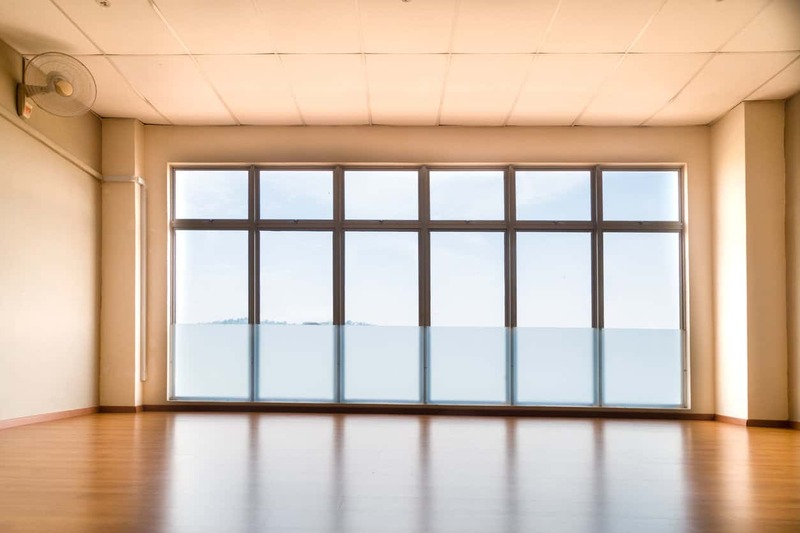 It’s one area to invest some money into because great window adornment can enhance a yoga studio considerably. Plants and small trees are an inexpensive way to improve your indoor space. Avoid vegetation in your yoga studio class space; however, in your reception area they can add a nice touch for a few dollars. With lighting, you can change the mood considerably, both in the light generated and the lighting fixtures themselves. Be thoughtful about the lighting and lighting fixtures you use and for not a lot of money you can enhance the design of your studio considerably. The following are some important elements. A quality floor. I prefer hardwood, but bamboo will do nicely. Exercise mat-floors are acceptable. 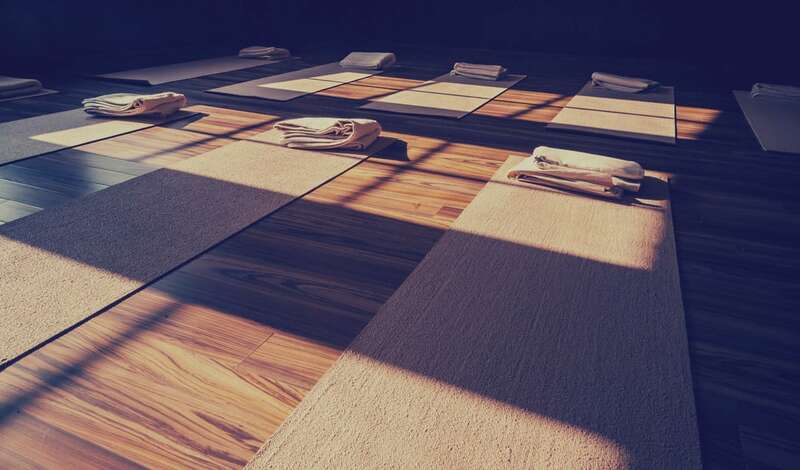 A well laid out space for your yoga class studio space is important. Whether you have 1 or more class spaces, ensure they are well thought out and separated properly. If at all possible, seal off your class space from the entry/foyer/reception. I’ve attended too many studios where when class is in session, I’m stuck waiting outside in a hallway or actually outside. I believe a small reception area is important. A clean studio. Fortunately, this costs very little. Clean is important and it’s amazing how many studios are NOT clean enough. Proper window coverings. Ensure they enhance the space whether blinds, curtains or otherwise. I especially believe it’s important to have the option to cover windows in the classroom. Some students may not like outsiders being able to peer into the classroom. It can be a distraction. Reception area. Many studios don’t bother with a reception area / foyer. I think it’s important worth the space investment. This way people who are a little early have a place to wait. It’s also a good place to accept payment and greet students. How much space to lease/buy? There are too many variables involved to provide any concrete guidance here. The cost for space varies considerably. So too does demand for yoga and the level of competition in various areas. However, the quandary is whether to get more space or keep it as inexpensive as possible. Get creative – there are many ways to turn excess space into revenue generators. 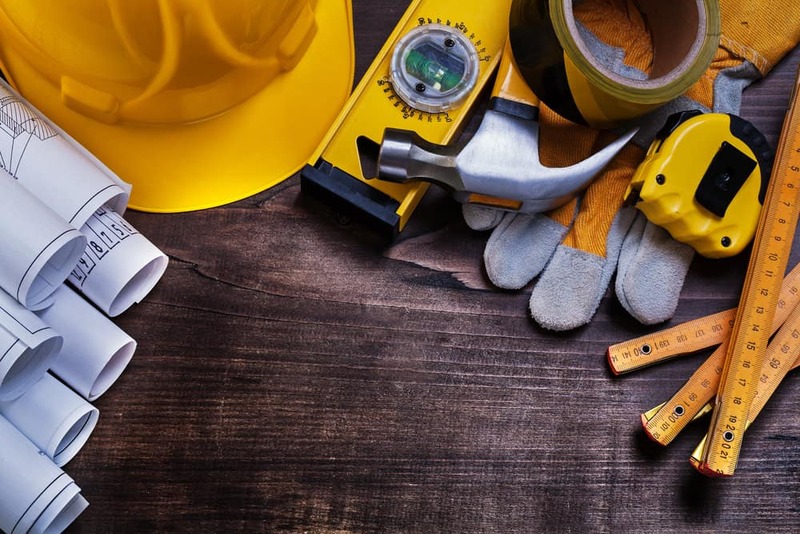 If you intend to sublet space out or bring in outside contractors, be sure it’s acceptable under your lease. If you haven’t signed a lease and you want to go in this direction, you’ll need to negotiate it into the lease (or ensure it’s not forbidden. As will all things legal, be sure to get the appropriate professional advice). Also, it’s best if you have people lined up to use some of your space before you sign a lease. You don’t want to be stuck with more space than you can handle. Space dividers are a good way to have the option for one or 2 class studios. However, they don’t look that great and don’t insulate sound very well. There are some substantial temporary wall room dividers that are more substantial, but they are cumbersome to use. I’m not sure it’s worth using in a yoga studio. Excellent Flooring: Hardwood, cork and bamboo. 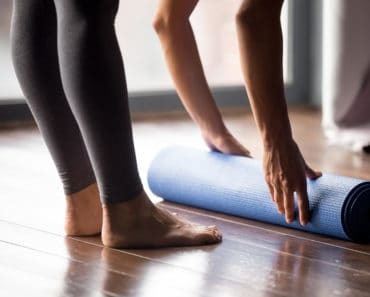 Acceptable Flooring: Exercise mat flooring. Carpet: gets filthy and stinky. You should budget your space at 28 to 30 square feet per student. That gives each student 7 feet by 4 feet wide for space. I don’t like doing yoga in cramped spaces if it can be avoided. Remember to reserve a little more space for you/the teachers at the front. Understanding the space per student is important for your business planning. You need to know how much revenue you can earn per studio class. Yes, you must make projections, but at the very least it’s good to know your student capacity for each class area. 1 or More Class Rooms? This is a difficult issue to answer for many yoga studios. Obviously, if you’re the only teacher, you only need one yoga class space. 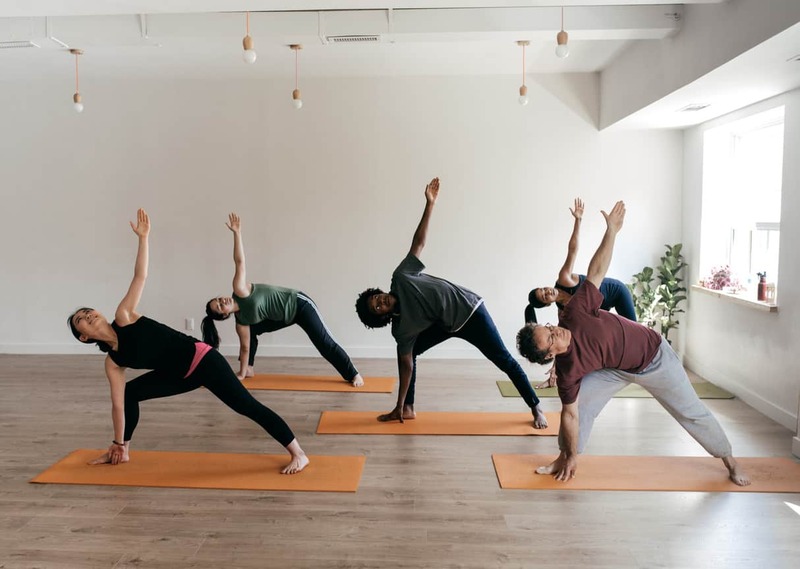 However, if you have multiple teachers, it may make better business sense to have 2 yoga class spaces especially if demand for both teachers is roughly equal. Most studios starting out on a limited budget will have one large class space. The first expansion is either adding more space to the single class space or creating a second-class space. The only way a second or third or more class spaces make sense is if demand for different teachers during the busy hours (usually evening) is spread across 2 or more teachers. If you have other teachers but find that most of your students take your classes (or a particular teacher’s class in your employ), you’re better off having one larger space. It would be a shame to turn students away from one class only to have the other class not full. Each studio must assess the number of classrooms individually. From a design perspective, one or more classes make no difference. This is a financial/business consideration only. Not all studio owners will have the luxury of choice here. The best ceiling height is 10 feet or higher. Vaulted ceilings are terrific. The minimum height should be 8 feet. 8-foot ceilings will accommodate a 6’ 4” person with arms extended straight above their head. Although 8-foot ceilings are the minimum height, it can look cramped in a large room. Therefore, if you have the option for higher ceilings take it. In the long run it will be a much nicer studio in which to practice yoga. Who doesn’t love plants and trees indoors? However, keep them out of the classroom. There’s no need to take up valuable space. Moreover, if you have plants and trees in your studio, maintain them properly. Dying vegetation and leaves on the floor doesn’t look inviting. Even one or a few small plants can dress up any design theme. Sound-proof the classrooms as much as possible to keep sound out and from sound getting out. If you have windows in the studio class space, consider translucent coverings to protect your students’ privacy (or at least provide the option). The ideal yoga studio reception area will include a kiosk/reception bar/desk where you can process payment and greet students. It also includes some seating or space to stand. If you can, provide space for shoes, bags and jackets. Get the most (business-wise) out of your reception area by offering some retail items. It could be a book/magazine shelf built into the wall (taking up very little floor space). It could be a small supplement shelf. It could be a wall of carefully selected apparel. Not only can this add revenue, but it adds some design elements to your reception area. Lounge area – yes or no? If you have space, a sitting area is fantastic. I love it when studios provide a couch and some comfy chairs to sit in while waiting for class or chatting with fellow students after class. I realize it invites students to stay longer than you might like, but it’s a very nice touch that students appreciate. However, don’t take away too much class space for a lounge. Only set up a lounge if you have some odd extra space that can’t be incorporated into class space. A washroom: This really is a must-have. If your building has one down the hall, that’s perfectly fine. In fact, that can be preferable to the washroom is not inside your studio. Locker Space: A place where people can lock up belongings is not necessary, but nice if you have the space and can afford it. Water Cooler: Your students will much prefer getting fresh water from a purified water cooler than going into the washroom for water. It’s a minor expense that well worth it. Sauna/Steam Room: I love sitting in a sauna after yoga. However, I realize few studios will invest in a sauna. It’s expensive, takes up space and requires maintenance. Don’t get an infrared sauna. That isn’t very good. If you need to choose between a sauna and a steam room, get a sauna. They are much less maintenance. Steam rooms require a great deal of cleaning. Showers: Showers are a nice perk, especially if you offer Bikram yoga and/or power yoga where people get sweaty. This is particularly good for the business lunch yogis. NOTE: Before investing in showers, a sauna and/or a steam room, ask your students if they want these items. They are expensive and if students don’t use them, you’ll waste your precious resources. Also, you could offer premium memberships that provide unlimited access to the luxury items such as a permanent locker, steam room/sauna. Again, each studio is unique and going in this direction is only worthwhile if your student feedback is that they’d be willing to pay for premium memberships for such amenities. The decision on whether to set up a retail store is a difficult one. The trouble with doing so if you don’t know whether it will be a good investment of time, space and money. However, generally speaking, I think a small retail area with carefully selected items can generate a good revenue stream. The fact is you have people interested in yoga in your space so they are bound to buy something. Treat your retail store as a curation of items by you. In other words, you want to offer what you consider to be the best of the best within a retail industry offering tens of thousands of items. This isn’t exactly a design element, but it’s important and should be mentioned. I believe given what yoga studios charge, they should provide a mat and any other gear needed for the class. A savasana blanket is also important. Moreover, and this is equally as important, set out the mats for your students and put them away yourself when class is done. Don’t ask your students to do the housekeeping. I know many hands make light work, but it’s a customer service touch that can separate you from the competition. Many studios run as a “self-serve” environment. Therefore, provide some superior customer service and your students will appreciate it. I can tell you I avoid studios that have a self-serve mentality and I’m not the pickiest yogi on the planet. Lighting is an excellent and relatively inexpensive way to improve your yoga studio design. Both contribute to design elements and appearance. Avoid bright spots. This can annoy students when lying down or looking up. Avoid bright lights generally: A bright studio space from natural light is great. Too much artificial light doesn’t look so great. At night, it’s nice to do yoga in a slightly dim environment. Spread lighting throughout the space: You don’t want brighter spots and dark spots. Use pot lights or track lighting so that light is evenly spread throughout the class space. Avoid light bouncing off mirrors. Get lighting that you can dim to different levels. This way you can dim or brighten as you wish. For example, dimming down further during Savasana is great. Keep it a little brighter so you and students can read any paperwork that is necessary. Candles are risky. You can start a fire too readily. Perhaps for special occasions, but be sure to be able to supervise all lit candles. The scent will differ according to the type of studio you operate. If you cater to an incense burning crowd, then, by all means, light it up. However, if your students don’t come across as big-time incense burners, tone it down. A little is a nice touch, but avoid creating a pungent atmosphere. A little incense sets a good mood and helps cover body odor generated from yoga. Therefore, a little is good; a lot if that’s the tone of the place. Try different incense flavors; however also burn the same flavors consistently so people come to associate your studio with particular smells. It creates a familiarity that people will expect, enjoy and feel comforted with when they enter your studio. Have a sign that requests students not wear perfume. It’s not an unusual request these days. Being in tight quarters, perfume can be annoying. Moreover, some people suffer headaches from smelling perfume. If someone attends reeking of perfume, don’t castigate them publicly. Take them aside after class and gently point out the no perfume policy. If you lose them as a customer that’s likely much less of a loss than a class full of annoyed students. I think plants in the studio, especially the reception area can be a great addition to your yoga space. 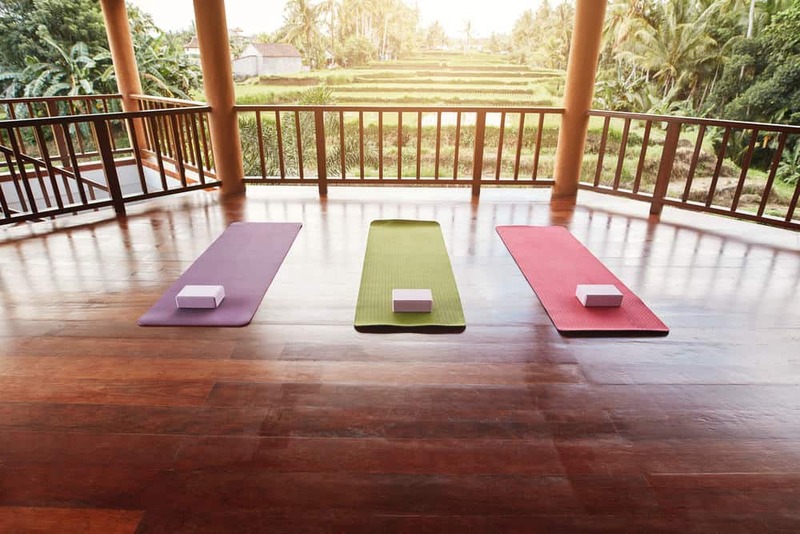 As for the actual yoga practice spaces, keep it to a minimum. You want as much spaced dedicated to yoga as possible. If, however, you can place them higher up on shelving that is out of the way, that can look fabulous. 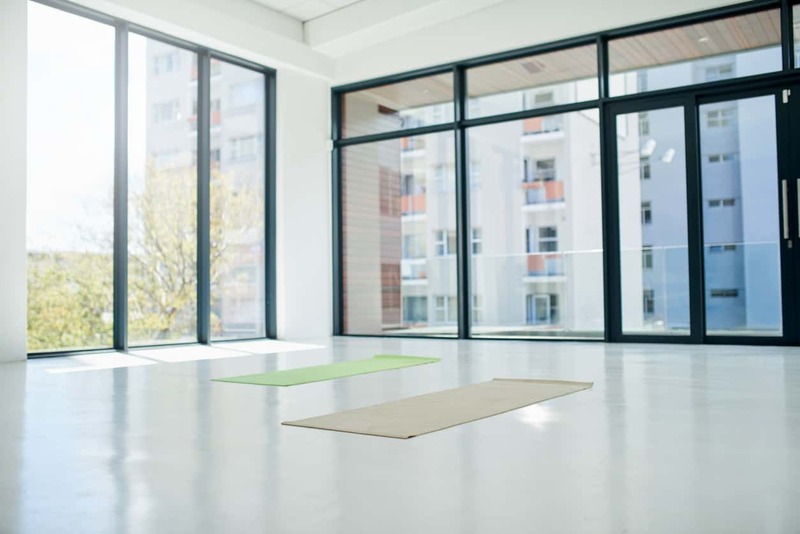 See our list of good plant options for a yoga studio. You can have a lot of fun experimenting with music. Music, like scent, can contribute to the overall atmosphere and experience of your studio. These days with Spotify and Apple Music, it’s so easy to create fabulous playlists for your classes. Avoid playing music too loud. Choose appropriate music according to your student-base. Experiment with different music; however, play some the favorites to provide consistency (people come to associate your studio with sound and smell). Massage: contract with a local massage therapist. If you have extra space, it’s a good way to earn from that space if/until you need it for expansion. Juice Bar/Snack Bar: Run it yourself or contract it out. If you go the massage route or snack/juice bar, be sure you get the appropriate permits, if necessary. 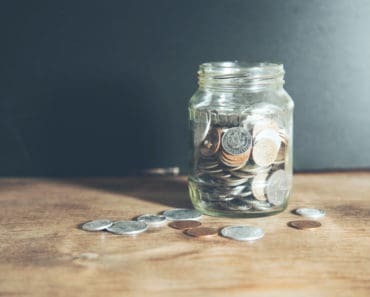 It could be an added hassle that’s not worth the effort; however, they could also be excellent additional revenue streams (even if you sublet it out). This is simple. By all means, decorate walls outside of your yoga classroom space. However, inside the class space, leave the walls bare. The reason for leaving class walls bare is so students can use the walls for inversions and other poses where walls can help. This includes not placing mirrors on the walls with the exception of the front wall (this can be a cool effect). By adding a wall of mirrors on the front wall, you create the illusion of much more space. Again, this may or may not enhance your studio design. Invest in a professional and attractive sign. Your sign is the first aspect of your studio many students will see when they arrive. If you have a horrible looking sign, they’ll be entering your studio with reluctance. This is called the primacy effect and it can be profound in how newcomers perceive your studio. See to it that the exterior and interior entrance is attractive, welcoming and clean. If you can, lease in a building that provides free parking. If it’s paid parking, see if you can get validated parking. I realize in some urban centers, free parking is not going to happen, but then people in those centers understand. Lack of parking can be a turn off and lose you students especially if the competition offers plenty of parking. Ensure you have sufficient signage so that people can locate your studio readily. If your studio is located inside a large building, ensure the directions/building entrance signs mark your studio location clearly. If possible, locate near public transportation. This way more people can easily access your studio. It also makes alternative transportation (to vehicles that is) a viable and attractive option. Yoga classroom with 3D art objects. Yoga studio with wood floor and stone wall. Industrial style yoga studio with brick walls, windows and white ceiling. Simple studio with full wall of windows . Small yoga studio design with light wood flooring, white walls, plant and yoga gear shelving. 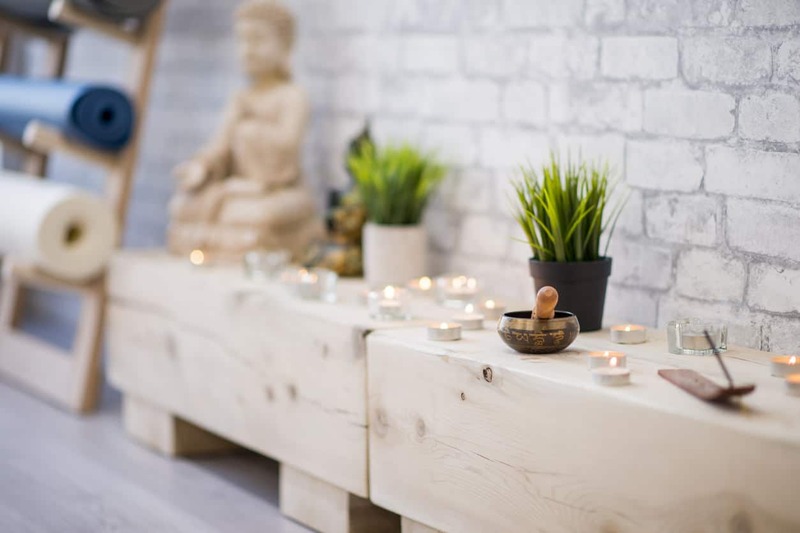 Close-up of stylish wood bench of meditation candles and plants against brick wall and yoga mat storage shelf. Warehouse loft converted to a yoga studio space. Check out that incredible beamed ceiling which contrast with the white painted brick walls. Here’s a basic yoga studio design but notice the lights. They added some funky suspended lights which enhances this simple space. This example showcases the funky floating wall shelves – you can lots of this to really enhance your studio design. Contemporary yoga studio design with white floor, walls and ceiling juxtaposed with black framed floor-to-ceiling windows. I love this design with the brick wall, white floor boards and reddish wood flooring. Attractive large yoga studio space with new light wood flooring, lots of windows and plants. The only thing I would change is the curtains. Example of a covered outdoor yoga studio with gorgeous wood floor and beautiful view. Check out that fabulous accent wall in this yoga studio. I also like the really dark wood flooring. 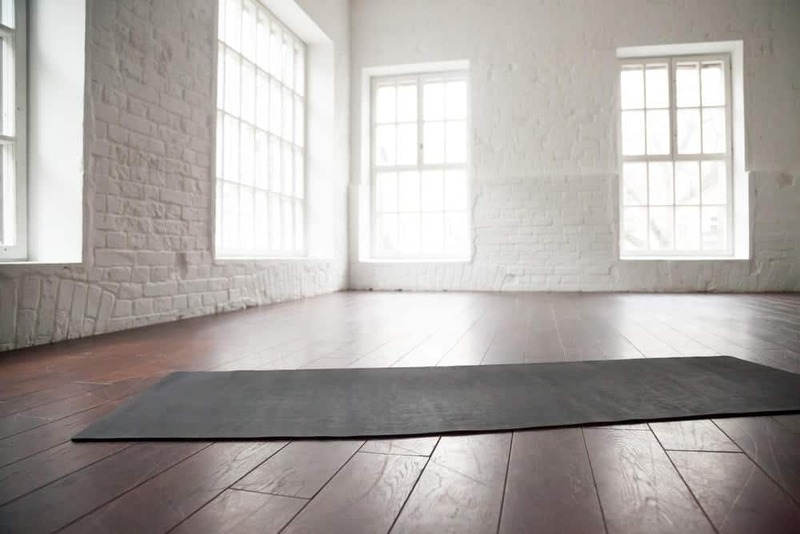 I LOVE this yoga studio design with white brick walls and refurbished wood flooring. So simple, yet so beautiful. I like how this studio provides carpet yoga mats with towels. Check out how this studio improved that terrible yoga studio ceiling. Very smart. I like the wood built-in bench in this yoga studio. I hope you find some of the points above helpful with your yoga studio design. Please note that the above is largely guidelines only. There are exceptions to almost every rule. At the end of the day, the main point is that design and the environment you create with your studio is important and can contribute to whether your studio is a success or not. How Much Money is Your Yoga Studio Leaving on the Table?